I ordered some parts yesterday from Stewart MacDonald in Ohio. They just arrived this afternoon. Ohio to Memphis to Vancouver to Victoria in 24 hours. Before they arrived I worked on the neck. I bought a nice piece of mahogany at a local shop, but it was warped, so I had to go back and get a straight piece. 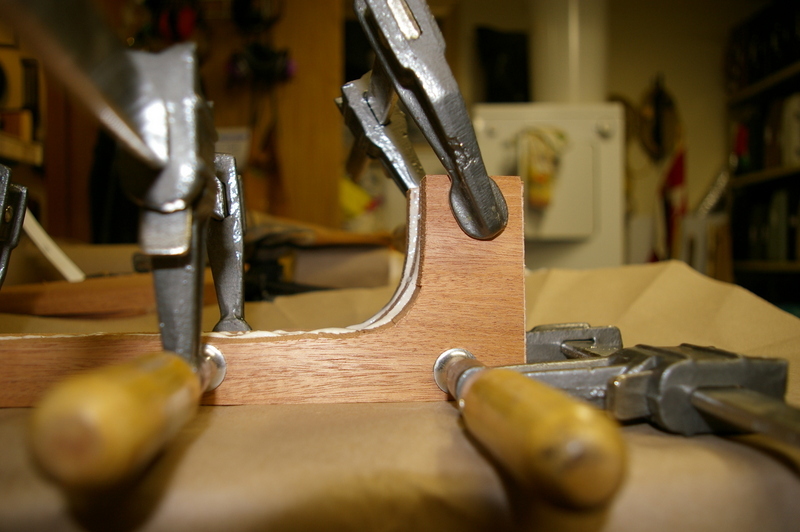 Earlier I spent several hours adjusting my band saw, which was working poorly. Now it works slightly less poorly. It’s a cheap thing and I’ve had it for years, so I suppose I shouldn’t complain. But I will. I discovered that the table was not flat. I don’t think it warped recently, it’s made of cast aluminum. All this time I had a warped table and didn’t realize. So I spent some time grinding the top of it on my bench sander. Then I adjusted the blade after watching a good video on Utube about this. So once it was working again I set to cutting the neck blanks. I already had a cardboard template for a 25″ scale, so I used this to trace the outline onto the mahogany blank. The blank was 3.5″ x 3/4″ and 5 feet long. I cut out four blanks, since you can get 2 per 2 foot length. They nest together. 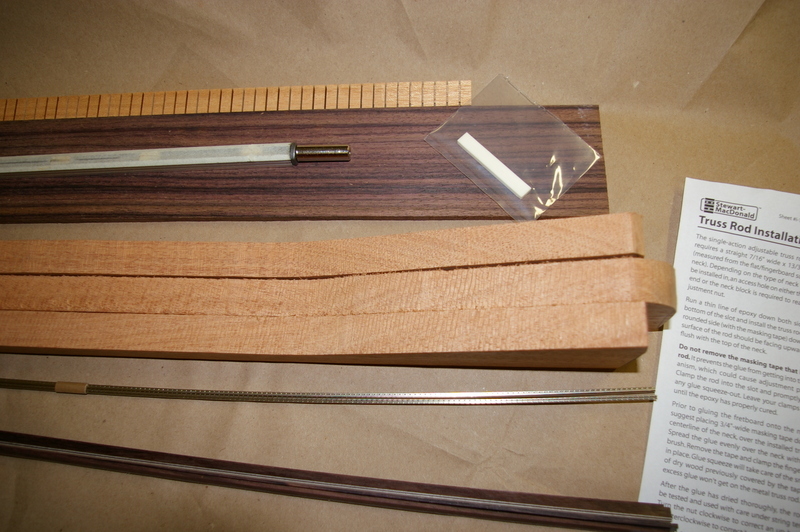 The extra length will be used for the neck and tail blocks inside the body. The saw cut better after the adjustment, but still a bit wonky. Next I took the 3 best pieces and set them on the bench with the long flat edges down. The finger board will be glued to this face. Then I liberally slopped on the Titebond type 3 glue, which is waterproof. If you want to be able to disassemble any wood parts, you have to use regular PVA carpenters glue, but for the neck pieces I used glue that cannot be heated or steamed apart. This is for one main reason. If ever the neck has to be removed in future, it gets steamed off at the joint with the body. I’ve seen the seams of the dovetail end of the neck separate a bit after this steaming, so I’m being careful here to ensure that doesn’t happen one day. 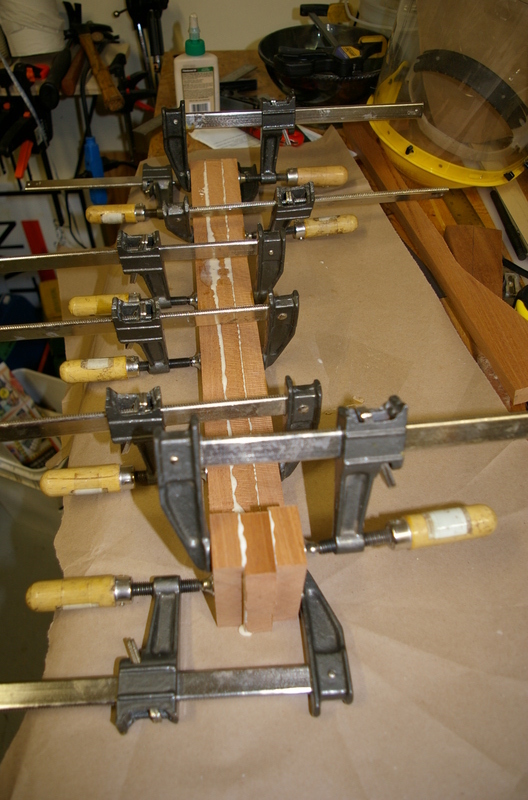 Once the glue dries I will shape the neck some more, and install the truss rod.